Venue – Department of Anatomy, University of Sri Jayewardenepura. What is the Japan Science and Technology (JST) Agency? A Research funding arm of Ministry of Education, Science & Technology (MEXT), Japan and works closely with universities/ research institutes in and outside Japan, that promotes state-of-the-art R& D projects, leads the way for co-creation of innovation. Formulation of Visionary Research and development strategies. Creating Knowledge & Transforming to Economic & Social Value. Sakura Science exchange program in science – To materialize a bright future of Asia and to enhance the exchange of youth in Asian countries and Japan. The e-ASIA joint research program – To develop a vibrant and collaborative research community in S&T, to promote innovation, to resolve shared challenges in East Asia and contribute to the region’s economic development. Strategic International Collaborative Research Program (SICORP) – To support large-scale international research collaborations on an equal-partnership basis, with partner countries and regions and in research fields designated through ian ntergovernmental agreement. Science and Technology Research Partnership for Sustainable Development (SATREPS) – To strengthen S&T cooperation with developing countries for resolving the global issues. 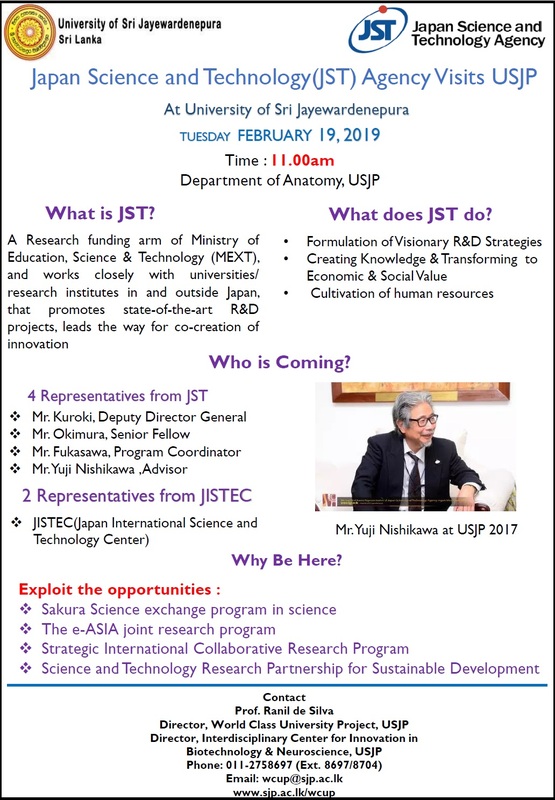 Mr. Kuroki, Deputy Director General, Japan Science and Technology Agency (JST), Japan (http://www.jst.go.jp/EN/operations/operation_d.html) together with three representatives from JST and two representatives from JISTEC (Japan International Science and Technology Center) will be visiting USJP on 19th February 2019 at 11.00 am to explore possible future joint research activities with JST Agency paving the way towards postgraduate opportunities with Japan as a result of the official meeting held on 29th November 2017 with Vice Chancellor of the USJP. Yuji Nishikawa, Advisor for International Relations and Cooperation, Sakura Exchange Program in Science (Sakura Science Plan: SSP), Japan Science and Technology Agency.